The NSUDH (National Survey on Drug Use and Health Studies) researches the incidences of alcohol and drug abuse in states across America. They take a look at several age groups including those 12 and older, those 12 to 17, 18 to 25 and 26 and older. Their research has found that the State of Michigan is either above or at other national levels for the use of illicit drugs, including those classified as pain relievers but not used for their intentional purposes. They also found that the use of marijuana in Michigan is at or above the national levels in every single age group. There also seems to be high levels of alcohol abuse as well. The State again ranked either above or at the national level for alcohol abuse and binging in every age group including those who are not legally able to drink alcohol. 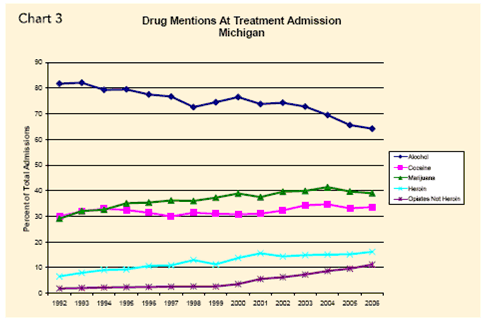 Michigan drug use rates have varied a great deal in a very short amount of time. Within four years the State went from being ranked in the top 10 in the country for the amount of individuals who were dependent on drugs between the ages 12 and 17 to amongst the lowest 10. Therefore, the measures used to prevent and stop drug abuse in adolescence and teenagers have been very effective. However, alcohol dependence rates have not changed much in all in this age over that same time period. There are a large number of Michigan alcohol and drug rehabilitation facilities. There are more than 500 of them total. There been a decline in their numbers between the years 2002 and 2006. However, that number wasn’t significant or large. The majority of Michigan drug rehabilitation centers are not-for-profit and private. Only 30% of them are for-profit and private. 12 drug and alcohol rehab facilities in Michigan are operated by tribal governments and the there are two that target Alaskan native and American Indian languages. The majority of drug rehab centers in the state offer various types of care with 93% of them providing outpatient treatments. Eighty-seven or 16% of the total Michigan drug and alcohol rehabilitation centers do provide residential care. Thirty-seven of them make available specialized care for opioids and there are more than 300 doctors and 60 programs that have the proper certifications to treat opiate addiction through buprenorphine therapy. More than half of Michigan drug rehab centers receive financial help from the government. This makes treatment more affordable for patients because the price of care is often subsidized. Sixty-five of all rehab facilities do work with managed-care organizations to provide services to people through their insurance company.